This is a sponsored post. All opinions are 100% my own and honest - please see my full disclaimer here as well as the end of this post for more information. I hope you enjoy reading! Christmas parties mean glitz and lots of sparkles. Is there anything more festive than a little - read: a ton - of sparkle? This year I'm saving the glitz for New Year's Eve, so today I'm showing you how you can charm and dazzle at Christmas parties - the elegant way! I've gone for head to toe ASOS, however you may notice that there's something very important missing from this outfit - accessories! For this festive season I'm thinking simple, smart and monochromatic on the outfit but dazzling, unforgettable and glamorous on the accessories. It's the perfect choice to look 'put-together', classy and effortlessly chic. Folli Follie create the most beautiful, timeless pieces and are one of those brands that I've lusted after for years - their website is always bookmarked in my favourites for a spot of 'window shopping' - and whenever ultra-babe Mollie King posts about them on Instagram, I'm instantly hooked again and want everything. Their collections are simply gorgeous and so I'm extremely excited to be working with them to bring you this fabulously festive post! It's quite hard to narrow it down, but their Match & Dazzle collection is my favourite and contains some divine pieces that I think would dress up this outfit and look totally stunning. I've chosen a fairly plain dress, however for me it's the details that make it - extremely well-made in a 'weighty' fabric, subtly structured in the top and with tons of volume in the skirt. I think it looks and feels much more expensive than it is and it creates a lovely 'foundation' to show the jewellery in its best light. I also paired it with a simple pair of heeled black sandals, which won't detract from the pieces but are all kinds of leg-elongating wonderful. These breathtaking Match & Dazzle earrings are possibly the prettiest earrings I've seen all year, and I'd be constantly tucking my hair behind my ears to show them off. Alternatively, I sometimes wear my hair up and think that a French twist or chignon would look lovely with the neckline of the dress, as well as letting the earrings do all the talking. The Match & Dazzle Bracelet is eye-catching without being over the top, and would add so much interest to this simple outfit. 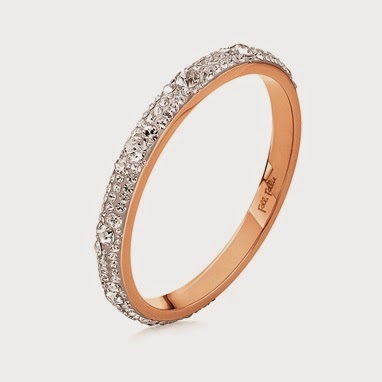 The fact it's plated with rose gold is the cherry on top also, as I love rose gold and think it looks especially beautiful against the clear stones. Along with a small bag to hold all of your party essentials such as the Reflections Bag, I think the outfit would be complete with these two items and they're definitely both firmly on my wishlist. 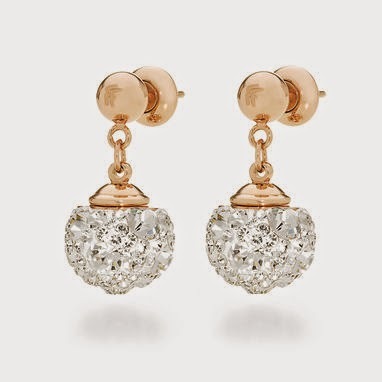 The earrings in particular, as I think they're timeless and would make a great investment piece to wear for years to come. I love the bracelet also, and would pair it with red nails like I've done here in this look. Red lipstick would also be perfect for Christmas! However, if you'd like to add a necklace to this look I do also have a few of favourites that I think would compliment the neckline of the dress beautifully - something simple but glamorous such as the Classy Necklace, personal and in keeping with the rose-gold theme like the Birthstones Necklace or pretty and romantic, such as the Heart4Heart Floating Necklace or if you always wear a watch, the Watchalicious Watch with its intricate dials and midnight blue is rather special - who doesn't love a great watch? Do you have a favourite piece? Which Folli Follie items would you pair with this outfit? This post contains sponsored content. There are no affiliate links used. Any items marked with an (*) were gifted to me. All opinions are 100% my own and honest - please see my full disclaimer here for more information. P.S. Please ignore my legs! I have Raynaud's syndrome which causes your blood vessels to temporarily spasm, blocking the flow of blood. It makes my legs and feet especially go purple, white and red as the blood flow returns - I massaged in lots of body cream to try and even out the tone and used a filter on the photographs so they don't look as bad, but they still look quite blotchy and sore. I love Folli Follie's jewellery, especially after I saw Mollie King wear it too haha. Love this dress to, its simple but so effective! You look great! I love all the accessories you picked as well! That dress is so lovely and the jewellery you chose would match perfectly! Meg, you're soooo classy! Also, those pins! Sexayyyy!